Integrative Eye Care is a complementary approach to both urgent eye care as well as eye health maintenance. Many of our patients seek an environment with a practice philosophy utilizing a holistic approach to health and wellness. For example: When evaluating a chronic inflammatory eye condition we look at the entire health and lifestyle history, which means that we look at how all areas of your life are connected. Do you work long hours at a computer screen or with a hand held digital device? Does stress at your job or in your relationship influence overeating? Are you using a sleeping device that may have a dehydrating effect on the eyes? How is your energy and enthusiasm for life? We look at what could be the source of the problem, and most importantly: Treat each person individually! Together, we look at how all parts of your life affect your health as a whole. Our approach does not eliminate all surgeries or conventional medical treatments. What it does is offer a different way of looking at your condition that may delay surgeries or in some cases prevent them, while allowing you to live your life in a happy and fulfilling way. Many of our patients may still use conventional medications but less of them, as they are empowered to manage the inflammatory processes which help control outcomes. Get to know us! 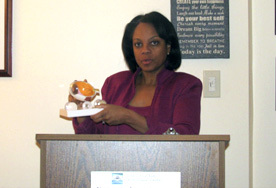 Each month we provide a free seminar on topics of interest expressed by inquiries at the Integrative Eye and Wellness Center and our North Shore Eye Center. We are fortunate to have guest lecturers, as well as our coaches who are experts on the topics. We coordinate our seminars with the monthly calendar of eye health and safety with the National Institutes of Health, The Illinois Prevention of Blindness, and the American Optometric Association. If you would like a more individualized consultation on any of these areas, our wellness coordinator will send you a health history form to complete. We will then set up a complimentary initial evaluation to establish your goals and determine if we can help you meet them. Many health issues are steeped in our diets. 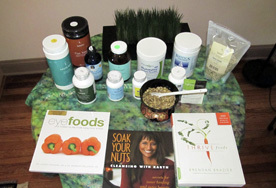 Our approach is to help rebalance the system which may include cleansing/detoxification and other nutritional support. We'll introduce you to some of the healthiest foods on the planet and teach you how to find what's healthiest for your unique body! During our programs, many patients report a feeling of overall well-being, a lift of a mental fog, more flexible joints, clearer skin and eyes, fewer digestive issues, a better understanding of their conditions or challenges, and an overall feeling of greater control over their lives. We are passionate about not dwelling on what you can't have but helping you to embrace all of the nutritious and healthy things you can have and enjoy! Our goal is to make your visits engaging, informative, fun, and rewarding. Together we'll work to reach your health goals in better managing your eye conditions, achieving optimal weight, reducing food cravings, increasing sleep, good ocular hygiene, and maximizing mental and physical energy. As we work together, you'll develop a deeper understanding of the food and lifestyle choices that work best for you and implement lasting changes that will improve your energy, balance and health. When the body is healthier the eyes are healthier. Our coach's approach is based on trainings in optometry, medicine, health coaching from the Institute of Integrative Nutrition, and training in Anti-Aging and Regenerative Medicine interwoven with our own individual clinical and life experiences. Whenever possible, we will look at natural approaches to your challenges, and how they might be best addressed in a complementary fashion with any conventional treatments. Bio-individuality™:The concept of bio-individuality is that each person has unique food and lifestyle needs. One person's food is another person's poison, and that's why fad diets tend to fail in the long run. Working on the principle of bio-individuality, We'll support you to make positive changes that are based on your unique needs, lifestyle, preferences, and ancestral background. We use a personalized, holistic approach to ensure that you will have great success! Primary Food™: It's easy to overlook all of the things that contribute to our sense of nourishment and fulfillment. It's not just the food we eat, but all of the other factors present in our daily lives. Healthy relationships, a fulfilling career, regular physical activity and a spiritual awareness are essential forms of nourishment. When these "primary foods" are balanced, what you eat becomes secondary. We will support you in achieving all of your goals, from eating the right foods for your body to living an inspired, fulfilling life.